Balance Physique For Women is an exceptional protein powder designed by Balance for the modern woman's active lifestyle. 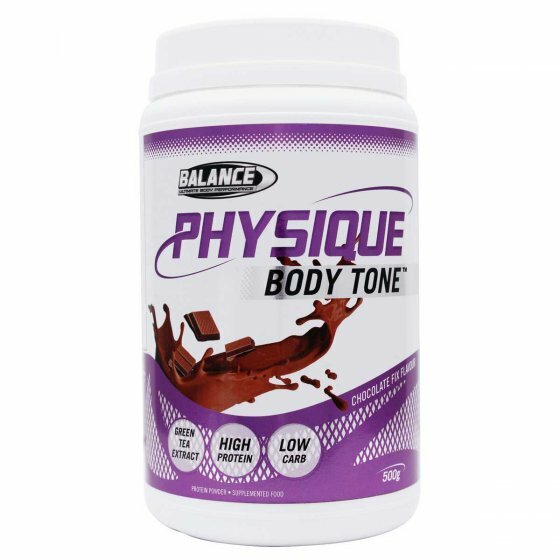 Balance Physique is a great source of whey protein which will help you feel full for longer, while also giving you that much-needed boost of energy before that big workout. Physique is great after a hard exercise to fuel your tired muscles and help your body to recover and tone those muscles. What's in Balance Physique Protein? Directions: Add 30g to 200ml trim milk or water and shake or blend until mixed. Balance Physique Whey Protein Powder Blend [Whey Protein Concentrate, Whey Protein Isolate (Contains Soy Lecithin)], Cocoa Powder, Dietary Fibre (Fructooligosachharides), Flavour, Vegetable Gum (Carrageenan, Xanthan), Garcinia Cambogia Extract, Vitamins & Minerals (Milk Minerals, Magnesium Oxide, Calcium Carbonate, Potassium Aspartate, Vitamin C, Ferrous Fumarate, Nicotinamide, Vitamin E Acetate, Zinc Oxide, Riboflavin, Calcium-d-Pantothenate, Pyridoxine Hydrochloride, Manganese Sulfate, Thiamine Hydrochloride, Folic Acid, Vitamin A Acetate, Chromium Polynicotinate, Sodium Molybdate, Potassium Iodide, Biotin, Selenomethionine, Cyanocobalamin, Cholecalciferol), L-Carnitine Tartrate, Anticaking Agent (Silicon Dioxide), Sweetener (Sucralose), Green Tea Extract.